We had a very fun and exciting first day back to school today! We started the day with a cute clip from the movie "Finding Nemo". We read a cute poem about Jitter Juice. (If you drink jitter juice, it will take the butterflies in your tummy away). We then made Jitter Juice together and drank our jitters away! We also wrote down the ingredients to our jitter juice and drew a picture so we could remember the secret recipe if we needed to make it at home. Another activity we did today, was we talked about one thing that we wanted to share with the class about our summer vacation. We shared our stories with a partner and then were given an index card to write and or draw that one experience we had in the summer. The students were then given an iPad to tweet their experience on Twitter. Our class Twitter account is @Mrswideensclass if you are interested in following us. Here are some of our tweets from today. In the afternoon we began talking about Math Stations and we had some exploration time with the math manipulatives. While the students were at the stations I asked them to brainstorm ways they could use the manipulatives during math and write or draw their ideas on the chart paper at their station. The students came up with some great ideas! As you can see, we had a very busy day! I can't wait to see you all tomorrow! 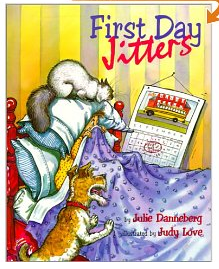 We read First Day Jitters on the first day of school too! We would really love the ingredients to your jitter juice so we could make it! Jitter juice is water, sprite or gingerale and magic drink crystals. If your teacher sends Mrs. Wideen your school address, we will mail you some magic crystals so you can make jitter juice too!